Watching her feed I realized that she was looking for nectar, and just happened to be covered in pollen. Honeybees generate static electricity with their wings, and that static charge builds up in their hair and attracts pollen. 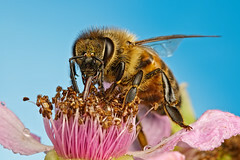 Since she was looking for the sweet stuff she just might take some bait because honeybees are also very task oriented –if they are looking for pollen then they won’t take the sweet stuff. But she was definitely going for the nectar at the very bottom of the Zucchini flower. 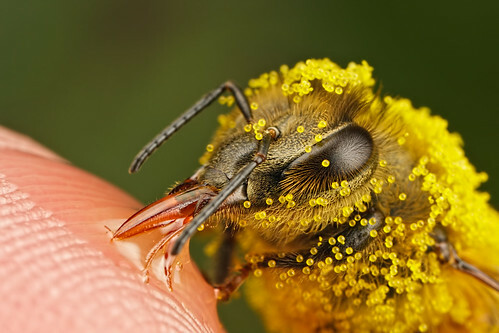 So when she came up to the top of the flower to do some pre-flight maintenance (there was so much pollen stuck to the hairs in her eyes she probably couldn’t see) I put some honey on the end of my finger and put it in front of her. She not only climbed onto my finger to feed on it, she let me stand up so I could position her in front of a grape leaf to keep the background from going black. Sometimes the flash would bother her and she’d fly off, and sometimes she’d just finish the honey and would move on. But each time she’d land less than a meter from me to try to get more of the pollen off, and each time I’d offer her a baited finger and go back to shooting. There was so much pollen on her that, even from a distance, I could see it falling like snow. I took a range of compositions and magnifications. I knew that it might be quite some time before I had an opportunity to shoot a cooperative pollen covered honeybee under almost controlled conditions so I wanted to make the most of it. One of the things that has me spoiled about shooting with the Canon MP-E 65mm is that I know what magnification I have to be at to get the framing that I want. Being able to simply dial in the mag without having to add or subtract extension tubes from a normal macro lens means that my EF-S 60mm doesn’t get as much time on the camera even though I can take it to almost 3x with a full set of tubes. I only edited three of the frames, saving the rest for this winter when there’s nothing moving and I want to post an image to my gallery. Below are the two that I like the most. As always they're single, un-cropped, frames taken hand held. I am the "finger model". Some of you are gonna want to over react to my using honey to bait honeybees. First it was probably their honey, since there is a hive less than 100 meters from where I was shooting and I bought the honey from the beekeeper that “owns” the hives (owns is in quotes cause we all know that women rule the world and the girls are just letting him think that their home is his). Also most beekeepers have told me, due to the small quantities that I use, that even if there’s something bad in the honey a healthy hive will not be affected. So relax. "What about all that photo paper that you don't use, you idiot. You know, the stuff you have laying around from ink jet printer kits that you had to buy when the store ran out of individual ink cartridges." The voice was right -suddenly I was getting that light shade of blue that I wanted to see in my backgrounds and all I had to do was gaffer tape a piece of photo paper to the back of the plexiglass, glossy side to the camera. If you try this trick yourself be advised that if you get the subject too close to the plexi that there will be a visible halo around the critter that's gonna be impossible to remove in post. I try to keep the subject at the same distance from the background that it is from the lens (maybe a little more). Here's a short video of me using the plexiglass in the field to shoot the image included with this post. Pretty basic stuff really, but the results are pretty nice.